Colombo, Feb 5 (newsin.asia) – The remains of the two Sri Lankan army personnel who were killed in an attack while serving the UN Peacekeeping Mission in Mali were brought to Sri Lanka on Monday evening and officially handed over to the Sri Lanka Army by the UN Peacekeeping forces, the army said in a statement. 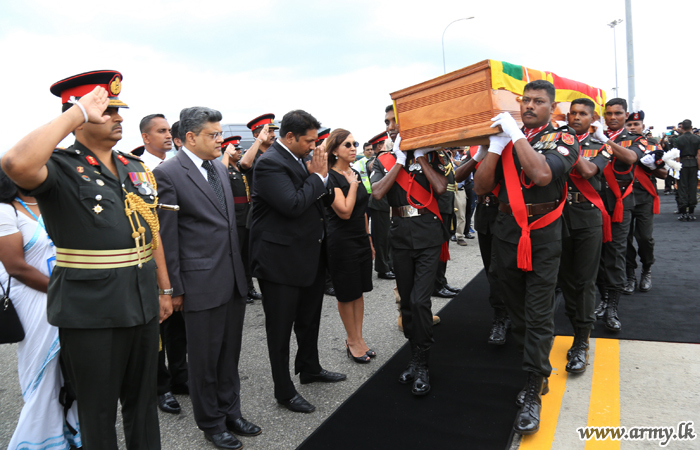 The remains of Major H. Jayawickrama and Sergeant S. Wijekumara which arrived in UN flag draped coffins were formally handed over to Army Commander Lt. General Mahesh Senanayake at the Bandaranaike International Airport, in the presence of State Minister of Defense, Ruwan Wijewardene and UN Resident Coordinator, Hanaa Singer. A solemn red carpet ceremony was held to pay tribute to the invaluable overseas service the two soldiers had performed on behalf of all Sri Lankans. The remains of the two fallen soldiers were then laid on gun carriages and troops presented a salute following which the remains were taken to the Negombo Hospital. The soldiers were killed when their armored vehicle came under a remote-controlled Improvised Explosive Device (IED) attack last month while they were on patrol in the trouble-torn area of Mali. Three more Sri Lankan military personnel were injured in the incident. They were rushed to a hospital in Mali. Sri Lanka has deployed a contingent of 200 army personnel for peacekeeping duties in the western African nation of Mali.